Police Chief Bill Scott speaking at a recent hearing on Tasers. As the San Francisco Police Commission considers arming the city’s 1,795 full-duty officers with Tasers, no one is clear on where the money will come from to pay for them. “There has been no discussion on funding,” said David Stevenson, director of strategic communications for the San Francisco Police Department. The consideration of Tasers, which the Police Commission could vote on as early as Nov. 3, is one of the 272 recommendations for the SFPD from a 2016 Department of Justice report. One of the cost considerations are the lawsuits that could be filed against the city if the devices are used inappropriately. At a Board of Supervisors meeting in late September, Fewer asked SFPD Chief Bill Scott how much it would cost to implement Tasers. He was unsure. “That’s one of the things that, if it goes further, there will be a discussion,” Scott said. It is unclear when that discussion will happen. District 9 Supervisor Hillary Ronen echoed other concerns. 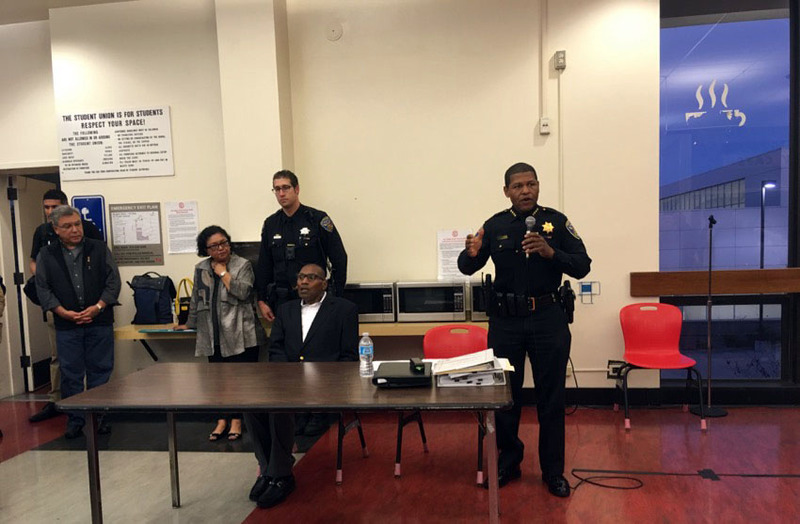 Michael Leonesio, a retired Oakland police officer and owner of the only independent Taser test laboratory in the country, said the SFPD’s technology department will be fighting for any new dollars. Each Taser comes with a number of costs — $1,103 for the Axon X2 Taser, $337 for cartridges, $341 for insurance and $743 for necessary additional tools — that adds up to $4.4 million for the SFPD’s current force. That sum does not account for training officers how to use Tasers. There’s also the issue of data storage. At present, the SFPD uses Axon’s data storage solution, Evidence.com, to store body-worn camera footage, which costs $79 per user per month. This is estimated to cost $196,000 monthly for the number of body-worn cameras the SFPD now owns. If the Commission approves Tasers, data storage costs will increase, according to Axon spokesman Steve Tuttle. The Axon officer safety plan costs $99 monthly per officer, which includes the costs of the Taser, body-worn camera and unlimited data storage. That brings the SFPD’s storage costs to $219,000 each month. “These weapons are going to be very very expensive to deploy — and deploy safely and effectively,” Leonesio said in a Commission hearing. And there is no mention of ewuiponb eaach patrol car with expensive difibrillators, to restart cardiac function if subject has a heard attack due to the taser.